Set your mower blade to the right height. Many people cut their grass too short, which weakens it and allows more weeds to grow. It also means you’re mowing more than you have to. Each type of grass has an ideal mowing height, so call Knutsen Landscaping to inquire about your specific grass. Generally, it ranges from 1 ½ to 2 ½ inches. Trimming around trees it not only time consuming, but you can also easily nick the bark, which can fatally damage young trees. You can avoid trimming around your trees by applying a 2- to 4-inch deep ring of mulch around trees and shrubs. (If your soil doesn’t drain well, you probably want it no more than 2 inches deep.) Be careful to keep the mulch about 3 inches away from the trunk itself to prevent disease, root suffocation and other problems. Skip spring fertilizing and do it only in the fall. It will provide nutrients for fall root growth and a shot of energy the following spring. Knutsen Landscaping can recommend the best fertilizer for your type of grass and soil conditions. Apply the fertilizer about three weeks before the last mowing of the season. This provides energy and nutrients for the grass roots as they multiply in the cooler fall weather while also giving them a head start the following spring. Stone or paver paths that follow the topography of your yard can let you mow without additional trimming. Paths conforming to your landscape require less upkeep than the more formal paths that include steps, walls and curbs. The key is to set the stones or pavers no higher than an inch above ground level. Then you can mow right over them and skip the extra trimming. Not only are these easy to maintain, they are can also be very affordable paths. Keep grass from growing along flower beds, walls, fences and other obstacles where your mower can’t easily reach by installing a mowing border. This will allow you to run your mowers over them to cut your grass without the need for separate trimming. If you set the border an inch above the ground and make it 4 inches deep, you will prevent grass from creeping over and through it. These are just a few tips that can relieve the amount of work required to maintain your yard. Contact Knutsen Landscaping for more ways to cut down on the work and free yourself up for a simpler maintenance routine of your property! Seat walls provide privacy and protection against the elements, and landscape lighting along paver walkways and patios, or under retaining wall caps, offers night time ambiance and functionality. Retaining wall systems are essential in preventing the damage to your property as well as the major headaches caused by erosion. In some cases, these can escalate to damaging your home. For instance, a yard that slopes steeply toward your home’s foundation is an easy way for water damage to become an issue. A well-designed and installed retaining wall system can create a positive flow away from the foundation, while also creating usable steps or space for flower beds and seating. Depending where your home is situated, you may have sloping hills that are difficult to maintain and that offer no usable space. These areas are prime candidates for retaining walls, seat walls, flower beds, or foundations that could accommodate a pergola or other structure. Why not optimize the usefulness of every area of your property? Most real estate agents will agree that your home’s first impression is paramount when preparing it for sale. Retaining walls and paver stone edging around gardens are simple updates that dramatically add value and curb appeal. For even greater impact, consider more ambitious projects like a front paver stone entrance with a patio and a seat wall or two. For most homeowners, there is immediate and lasting value to be gained from adding hardscaping to your outdoor living space. Contact the design professionals at Knutsen Landscaping to determine the best options for your property, and see the impact for yourself! You Bag It. Yard Jockey Hauls It. Your lawn and garden are a reflection of you. Your care and effort make the grass greener, the flowers brighter, and the trees healthier. But when it comes to all debris you generate from mowing, pruning, weeding, and trimming, you may not have an effective way to recycle the yard waste back into the earth for a sustainable cycle of renewal. Yard Jockey’s bags are your solution for outdoor projects, large or small. Purchase a reusable bag today! Our durable, reusable yard debris bags hold a full cubic yard of waste like grass clippings, branches, bush trimmings, mulch, edgings, and leaves! They offer a convenient way to keep your yard looking nice during and after weeding, pruning, or mowing. Avoid those messy piles that take up space in your driveway or block use of your lawn. Purchase a reusable bag today to recycle the yard waste back into the earth for a sustainable cycle. Simply call for a pick-up when your bag is full! 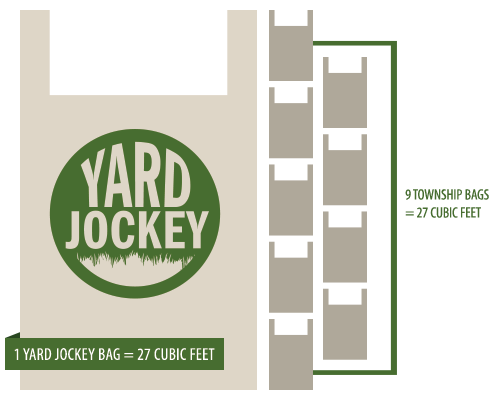 Buy a Yard Jockey bag for $20. When your bag is full, go online to yardjockey.com and click the “haul it away” tab at the top to pay and schedule your pick up — just $30 a bag! Your Yard Jockey bag will be returned so you can move on to another lawn project. Order a bag online* or call us at 717-786-9000. Yard debris includes brush/trimmings, tree limbs, grass clippings, stumps, leaves, soil, sod and rocks/stones. Spring is the season for renewal. Trees are budding, grass is shedding its winter brown, and birds are returning to their warm weather homes. So it is perfectly fitting that homeowners see spring as the time to begin landscaping projects. What better time to rejuvenate your outdoor living space? The National Association of REALTORS® recently published a nationwide study examining the reasons home owners complete outdoor remodeling projects, the value of those projects, and the increased happiness on their completion. Ten different projects – the top ten according to the REALTOR® rank of projects’ appeal to buyers – were evaluated, and the results offer a range of appealing and profitable upgrades. Of course, upgrading your outdoor living space does not benefit you only when it’s time to sell. The REALTORS® poll also tracked consumers’ viewpoints after completing projects. After installing a new deck, 77 percent said that they had a greater desire to stay home, 51 percent felt an increased sense of enjoyment, and 77 percent had a sense of accomplishment on completion. Even higher results came from a new patio: 82 percent expressed a greater desire to be home, 74 percent report more enjoyment, and 85 percent felt a major sense of accomplishment. The highest happiness rating came through adding a new pool: 95 percent claimed a greater desire to be home since installing one, 80 percent have an increased sense of enjoyment while at home, and 90 percent felt a major sense of accomplishment after completing the project. So whether you are looking to sell your home or simply get more enjoyment from your property, investing in your landscaping and hardscaping can pay big dividends. Contact Knutsen Landscaping to discuss your goals and options. Together we can put together a plan to make the most of your outdoor living space. An essential element of your landscaping is certainly outdoor seating. After all, isn’t one of the reasons for all that work and investment hosting a dinner party, family gathering, or just good friends? Of course, there is a lot to consider when choosing a design for your outdoor entertaining: your goals, plans, and – of course – budget. Outdoor fireplaces – There are many options, from rustic, portable, permanent, to materials like copper, brick, stone, and more. Fire pits – In recent years, fire pits have become one of the more popular outdoor entertaining options. Although not quite as unlimited in scope as fireplace options, there are still plenty of different choices to suit your needs and budget. Grill areas – With outdoor grill areas, the choices are almost endless. Of course, you’ll want to think about how many guests you may be grilling for and how much seating you want in close proximity to the grill itself. Outdoor kitchens – If a grill or fire pit is too limiting for your plans, why not do an entire outdoor kitchen? Grills, smokers, pizza ovens, and cooktops can all be incorporated into your outdoor kitchen. And of course, here is where the seating really comes in to play. Everyone always hangs out in the kitchen indoors, so the same patterns will carry outside. Embrace it! Pool landscape design – A pool will often be a central point in outdoor landscaping, and you can incorporate seating as much or as little as desired. More seating in the pool area will of course encourage your guests to spend more time in that area. Water features – Fountains, ponds, and other water features add character and interest to any landscaping. And you must consider whether you want seating around them or whether they should more separated from your seating areas. Pavilion and pergola – A more dedicated seating design element is a pavilion or pergola. They provide shade, protection from the elements, and distinct space definition for outdoor entertaining. These will often be central to your seating design. Certainly, combinations of these and other design ideas will determine your outdoor seating needs. Knutsen Landscaping is here to help! We’ll meet with you on-site to determine your goals, initial plans, and budget for this project. Christmas Trees: Environmental Benefit or Burden? The next in our series of trees we recommend for use in local landscaping is the famous Serviceberry! The experts at Knutsen Landscaping have compiled a list of trees indigenous to our region in Pennsylvania. Serviceberry trees produce berries that are safe for humans to eat, but often feed birds and mammals. The berries start out red and turn to a purple-black color; and will grow from early summer until August. These berries taste very similar to blueberries and can be eaten raw or put into pies and pastries. The tree earned it’s name from the use of its flowers in religious services. Has small, oval shaped leaves edged with small teeth—dark green in the summer and turning to red, orange, and yellow in the fall. Grow to between 15-20 feet. The second in our series of trees we recommend for use in local landscaping is the beautiful Eastern Redbud! The experts at Knutsen Landscaping have compiled a list of trees indigenous to our region in Pennsylvania. Known as the ‘Harbinger of Spring’ as it’s bright colored blooms signal the start of the season. Some cultivars have different colored flowers (white, pinks, purples), while others have variated foliage colors (white variegated, green, yellow, orange, red, purple). The covey cultivar has weeping branches. Cultivars include: Appalachian, Forest Pansy, Ruby Falls, Hearts of Gold.